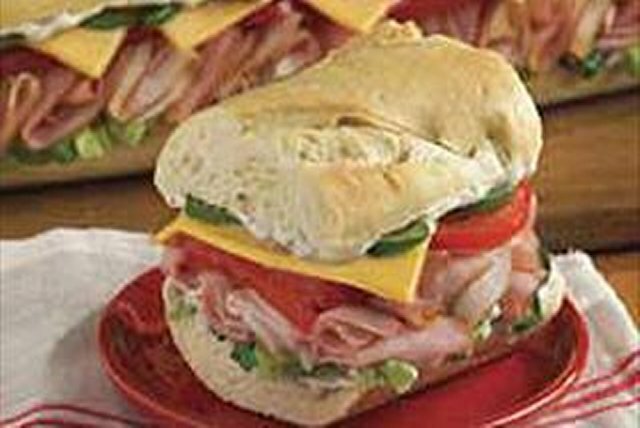 Not to brag, but we think this sandwich, with ham and turkey seasoned with MIRACLE WHIP Dressing and herbs, is particularly heroic. Spread cut surfaces of bread loaf with dressing mixture; fill loaf with remaining ingredients. Cut crosswise into 8 slices to serve. Add GREY POUPON Dijon Mustard to the sandwich for a sophisticated taste. Serve with 1 cup baby carrots and an 8-oz. glass of fat-free milk.